FxPro reviews conducted by Topforexbrokers.com experts about Fx Pro broker, In this Fxpro review you will know about Fxpro login, Fxpro MT4 download, MT5, FxPro Direct, mobile trading, Supertrader and cTrader, as well as information for opening a free FxPro demo account and important information about Fxpro minimum deposit and withdrawal methods or problems. Be sure to read this Fxpro reviews to the end before open account with Fxpro.com or FxPro.co.uk forex broker. FxPro broker was founded in 2006 in Cyprus by Denis Sukhotin. The brokerage began its expansion with the opening of representative offices in Austria, France, Spain and Russia. In 2010 Fx Pro was granted regulation and licensing by the UK’s Financial Services Authority and opened its London office. In 2011 the company opened an office in Australia, however it shut this down in March 2013 and moved those clients to its Cyprus and UK operations after new capital regulations came into force in Australia. In 2011 the broker started offering Electronic Communication Network (ECN) trading access to some of its clients. In 2012 the brokerage moved away from being a market maker in favor of a no dealing desk (NDD) or agency model. This means that trades are now passed straight through to liquidity providers. FxPro Financial Services Limited is licensed and regulated by the Cyprus Securities and Exchange Commission (CySEC). In 2007 the EU’s Markets in Financial Instruments Directive (MiFID) came into effect. This allows firms that are regulated in Cyprus to provide investment services anywhere within the European Union. FxPro UK branch, a wholly owned subsidiary of FxPro Group Ltd, is licensed and regulated in the United Kingdom by the Financial Conduct Authority. The UK branch acted as an introducer to its parent company and did not provide any brokerage services or hold client funds until June 2012, when the company upgraded its FSA license so it could accept UK clients. The company provides traders a choice between the MetaTrader 4 and cTrader trading platforms. Clients using the MT4 platform from MetaQuotes Software also have the option of a web-based alternative, and several mobile trading versions. The company’s cTrader platform Spotware, provides ECN traders with greater price depth and Volume-weighted average price (VWAP). cTrader is compatible with cAlgo, an algorithmic trading platform that allows clients to create trading robots and run them in cTrader so as to fully automate the trading process. Since 2013 the company has been engaged in making algorithmic trading accessible to the retail sector. It launched Quant, a web-based strategy-building solution for the MT4 platform that allows users to create their own trading robots (called Expert Advisors) using a drag and drop interface, or to download them from the company’s EA library. Quant, unlike cAlgo which requires knowledge of C#, enables users to create automated strategies using technical indicators and logical operators without any prior coding knowledge. In October 2013 the broker launched its proprietary investment platform SuperTrader, which gives retail or institutional investors the ability to allocate funds to a number of strictly vetted and performance rated Forex trading strategies. MetaTrader 4 has established itself as the industry standard. Combining an intuitive user interface with a customisable feature-rich environment, MT4 trading platform provides everything a trader needs to chart assets, place orders and manage their positions. Add to this broker’s advanced trading infrastructure, competitive pricing and Forex Agency Model execution, and you have one of the most powerful combinations in online forex trading. FxPro UK offers CFDs through MetaTrader 4 on Forex, futures, selected stocks and spot metals. FxPro broker also welcomes algorithmic traders. Use MT4 in conjunction with Expert Advisors to automate your trading. With access to three different chart types, nine time frames, over fifty pre-installed technical indicators and a fully customisable interface; MetaTrader4 gives you the ability to monitor the market with precision, perfectly timing your entry and exit each time. For free Fxpro MT4 Download simply Visit Broker above this FxPro review page. MetaTrader5 is a powerful all-in-one platform that provides you with everything you need to trade the financial markets. Continuing its predecessor’s impressive legacy, MT5 is both powerful and easy to use, allowing you to customize its layout to suit your trading style. Analyze the markets with a large selection of pre-installed technical indicators and graphical objects, place orders and manage your exposure with ease. A relative newcomer to the world of charting platforms, cTrader has already developed a loyal following among traders who demand an added level of market resolution. Designed specifically for the trading of CFDs, cTrader platform is an ECN (electronic communication network) trading platform allowing traders to place orders while having access to full market depth. The broker provides its traders with the best available bid and ask prices, even when they come from competing institutions, and fills orders at VWAP (volume weighted average price), executing through the available liquidity tiers until the order is filled. This enables us to offer some of the tightest spreads in the industry, with raw spreads from 0 pips on highly liquid pairs such as EUR/USD. SuperTrader is an investment platform which gives you the ability to copy and allocate funds to the trading strategies of SuperTrader leaders. In this way you are able to create your own portfolios of strategies according to your individual risk/return preferences, without having to actually place any trades yourself. Leaders do the trading, and investors decide on how much capital they want to allocate to each strategy, and how they want to manage their risk. Please note SuperTrader accounts are not currently available for UK registered clients. For clients who have previously been approved by our Back Office department, your SuperTrader account will be approved once a Limited Power of Attorney has been accepted via the online form in Direct. For new or existing clients who haven’t provided the relevant documentation, their account will remain pending until these documents have been received, reviewed and verified. Fxpro Minimum Deposit on MT4 and MT5 fx trading platforms is $100 and on cTrader Forex trading platform is also $100. FxPro broker Direct is your online account management page. To login to Fx pro Direct Simply click on “Visit Broker” from top of this page and Signing in to the brokerage homepage automatically takes you to your personal Direct profile from which you can create new accounts, edit existing ones, fund your active trading accounts and download all of the various trading platforms we offer. You also have the option to edit your profile, change your address and contact information, as well as editing your mailing options and other subscriptions. All the company direct members have access to All features whether they are live trading or still practicing in demo Forex account. They include: EA Library, Quant, VPS, Dashboard, Trading Central, Autochartist, Economic Calendar and Market News. The broker has several account types like demo, micro, standard, VIP and PAMM accounts. Fxpro Demo account is the perfect way to practice Forex trading in a risk free environment before committing any of your own money to the markets. The broker demo accounts are completely free. 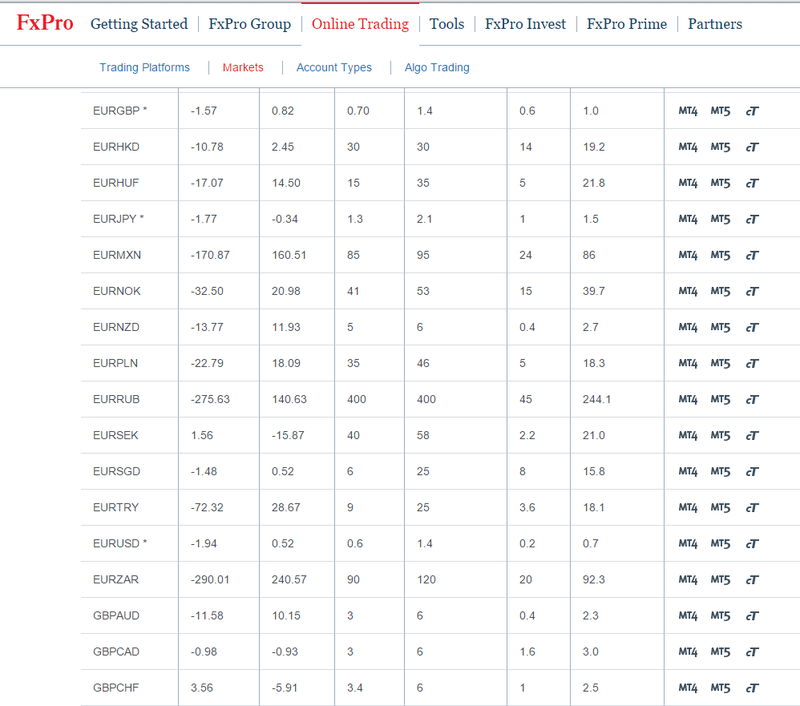 By registering you also gain access to our exclusive trading tools and services through Fx-Pro Direct. To open your Free Fxpro Demo Account Simply click on “Visit Broker” from top of this FxPro review page. The company provides micro lots and you can start trading from 0.01 lots with a FxPro micro account, The micro lots trading is available on all of the broker’s platforms. You can withdrawal or deposit by Debit and Credit cards, Bank Transfers, Skrilll, Paypal or Webmoney. Withdrawals from your investment account are typically processed within 48 hours of the request, but each brokerage has different withdrawal guidelines, so be sure you understand the minimum deposits required in your trading accounts, as well as withdrawal processes before you commit to any particular brokerage. Account currencies are in USD, GBP, CHF, EUR, PLN, AUD and JPY, Depends to the method you withdrawal your funds the broker charge up to $20 as Fxpro Withdrawal Fees. To do FxPo login simply sign up with the broker then check your email and follow instructions to open a free demo trading account and do free fxpro account login to mt4 platform. FxPro Cyprus received its CySEC licence in 2007 [ CySec, licence no. 078/07 ]. The broker operational office address is : Karyatidon 1, Ypsonas 4180, Cyprus. This Fxpro reviews conducted by TopForexBrokers team and include all information you need to know about the FxPro broker before open trading account, If this Fxpro review helps you to get all information about the FxPro broker so Like and Share it please. More information about FxPro review can be find Here.